Give this fun & creative Personalized Maternity T-shirt to your favorite New Mom. Let her be comfortable and relaxed during her pregnancy in this Personalized New Mom Tee Shirt. Our Personalized New Mom shirt is available on our premium white 100% cotton Personalized T-Shirt. Shirt for the expecting mom is machine washable in adult sizes S-3XL. 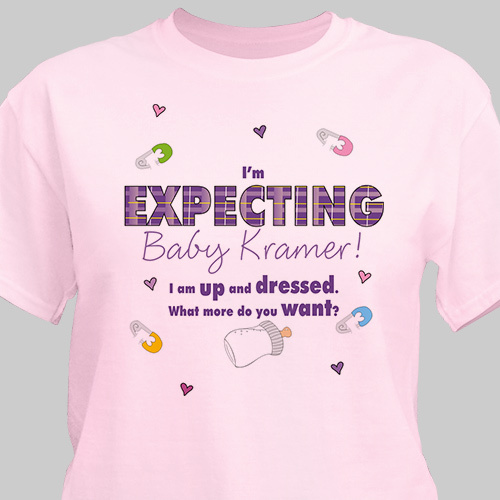 Personalized Maternity T-shirt is also available in Pink. New Mother Shirt includes FREE personalization! Personalize your New Mom Maternity T-shirt with any New Mom's name. This is so cute.My granddaughter is wearing it for her baby shower. This is great, a heavier cotton than I expected. Will be nice for a shower gift. Makes an excellent First time Mother's Day Gift! If you need a gift for an almost mom for this Mother's Day try our line of expectant mother shirts and apparel. GiftsForYouNow.com has many additional Personalized Mother To Be Gifts for your lovely expecting Mom. We also specialize in comfortably fitting Personalized Maternity Shirts plus much more for the new Mom.